It's finally here. I ordered it on my birthday (happy birthday to me!) and picked it up this evening. I like the "make the deal in the parking lot" pic. Whoa. That bike is hot! I'll say it again: his bikes are the only swoopy framed creations that I've seen that I've liked, and would actually consider buying. How small is that frame? Gorgeous bike. 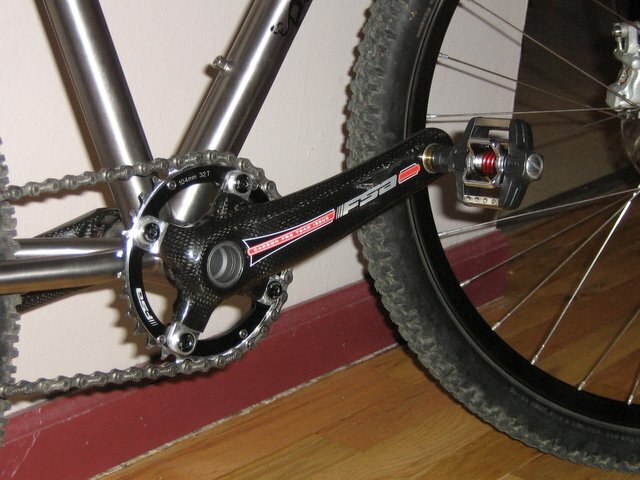 Really love the wheels, ti bar, ti seatpost and the carbon crank. 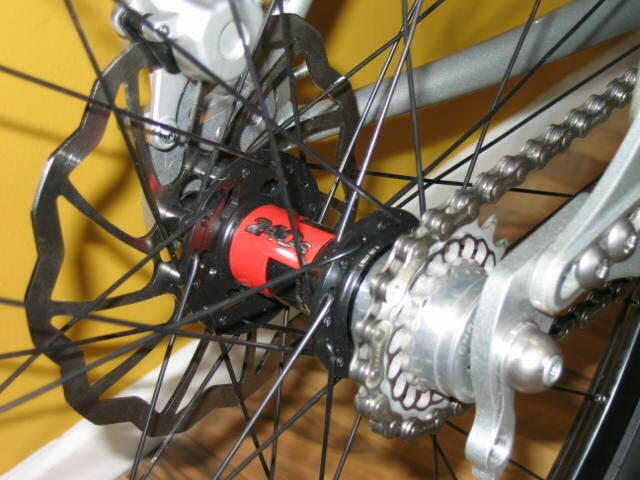 What's the design rationale behind the short little tube connecting the top-tube and down-tube? It looks good, but what does it accomplish? Very nice brg, another beautiful sheep to look for on the front range!! Very nice brg!! I can't wait to see that ride in person, have fun this weekend...but wouldn't Fruita be the perfect venue for the maiden voyage? Beautiful - maybe it is me, but that looks a little small for you? 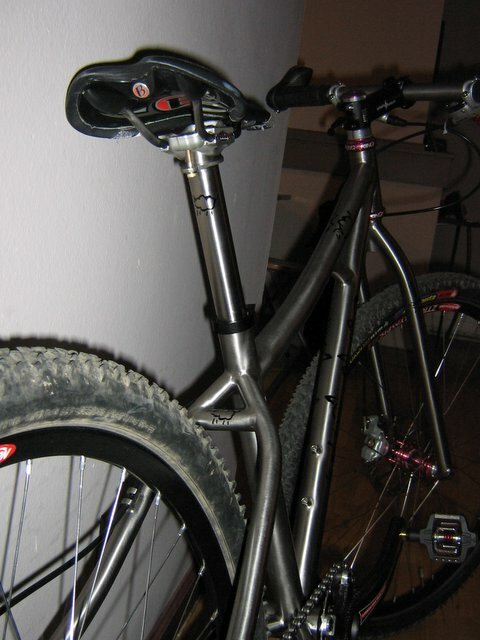 Do you raise the seatpost up more when you ride it or something?? Ha ha ha MMcG...That's James the builder, brg is like 4'11" but if you see her on the trail...well she rides like she's 10' tall and bullet proof...so LOOKOUT!! yeah - James' shop is 1.5 hours away - we met in a parking lot at the halfway point for both of us. It's an 11 inch frame. I'm 4'10" and weigh 105lbs. 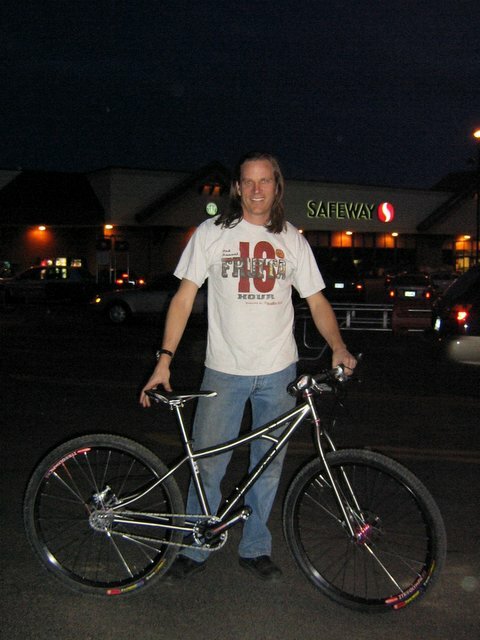 The guy in the picture is the bike designer/builder, James and I think he's around 6'2"
Last edited by brg; 03-10-2007 at 10:22 PM. 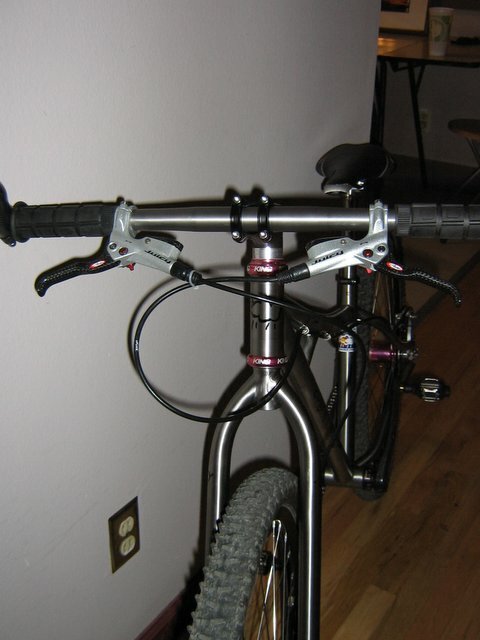 I'm not sure what the short little tube between the top-tube and down-tube is for. I know his cruiser style bikes have it also....because I'm petite (4'10" with a 26.5inch inseam) he did a reverse bend from the cruiser style in order for me to get the stand over i need. but wouldn't Fruita be the perfect venue for the maiden voyage? yes- Fruita would be the perfect maiden voyage (you are as bad as my friend, Jeny) but alas - it's not in the cards for this weekend. that's the bike designer/builder in the pic - he is 6'2". I'm female and stand a whopping 4'10" tall! oh! and the bike fits me just fine! According to James it is strictly cosmetic. But yours won't fit me. 6'3"-guy-compatible version with 29" wheels, please. brg, you've got the ultimate bicycle for you there, IMO. I don't even need a new bike but I'm saving up for a Black Sheep anyway. 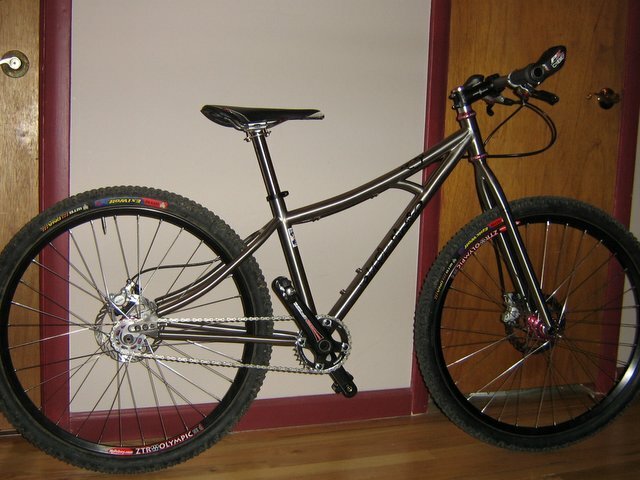 James makes such awesome creations that I believe I DO need a new bike! Even though I don't! I'm so confused! Okay, got it now -- I do. Anyway, way to freakin' GO, brg! i have a question about the paragon sliders, does james normally mount the sliders to the stays like that? 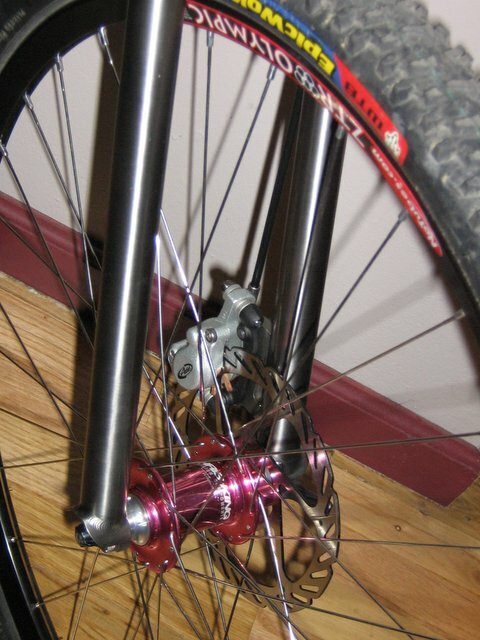 i've seen a number of his slider bikes but never seen a close enough picture of dropout area before to see how they were mounted. brg - I just got my Highlight this week and it rides awesome! Great choice in a builder. I'm guessing this is his standard mount of sliders. He didn't mention doing anything special for them. Maybe some of the other Black Sheep owners can pipe in. he said he was fixin' to deliver a frame to another Front Ranger today. I like the highlight design but @ 4'10" with a 26.5 inch inseam - the lo-light is a better choice for me. i dunno about that dave! i think with your new Black Sheep - I'll never catch up to you! If you every want to be free of your compulsive obsessive disorder, I'll take that titanium demon off your hands for free. looks the same way I've seen other Paragon's mounted. Wow, that is one of the nicest looking bikes I've ever seen. Enjoy it! DROOOOOLING, what a beautiful ride; enjoy it. Beautiful. Thanks for sharing, brg! I couldn't think of a better way to celebrate life than the build of a custom bike. P.S. The grocery store parking lot is, in our current society, the town square. It's the place of many ebay and craigslist transactions! Another nice sheep! 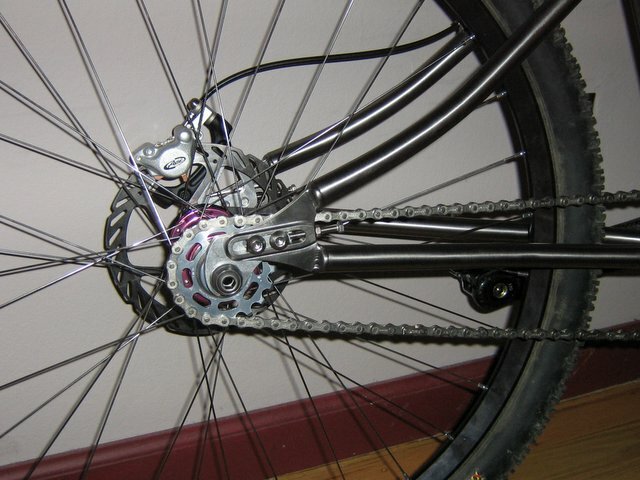 The only thing I'd do differently on a custom rigid bike is a non-suspension corrected front end.